Bring the elegance of the outdoors in your property with this a single-of-a-kind masterpiece crafted from naturally cured hickory. Every hickory stick utilized is cautiously selected from abundant hickory forests in United States. The sticks are dried naturally for 3 months, then dried in a kiln to the precise moisture content material ideal for hickory furniture producing. Knowledgeable steam benders use the hundred year outdated method of applying steam and strain to completely bend each and every stick to the wanted shape. Sticks are very carefully reduce and fitted using standard joinery strategies to build a all-natural masterpiece that will final for the ages. All goods are customized manufactured by Pennsylvania Amish (some assembly essential). Dimensions: 20L, 15W, 20H. Ships through Fed Ex Gound. 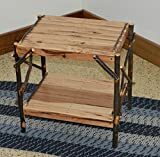 All Hickory End Table (Hickory Top & Shelves with Hickory Accents) Add a little rustic feel to any room with this sturdy beautifully built end table, constructed by the Pennsylvania Amish.